After a long day of poker one man was left standing, and David Olson is that man. The $10,000 Limit Hold'em Championship reached its epic conclusion on the third day of play and after a hard fought battle it was Mikail Tulchinskiy who caved under Olson's pressure. The day started with 10 players and within a matter of hands it was Robert Como who hit the rail in 10th place. Gabriel Nassif was next to go after clashing numerous times with Greg Debora who seemed to cruise to the win during the first levels of the day. The two most accomplished live players at the final table, Jan Sjavik and Bill Chen, were next to go and so we were down to five. Paul Mannoni, who had been relatively quiet up until then, put up a good fight but busted in fifth place. 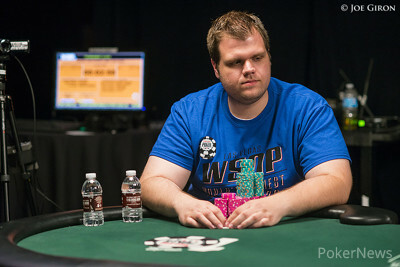 After the dinner break it was Samuel Golbuff who had a good shot at taking the event down, but surprisingly enough he busted in fourth place. When it got down to three handed it was still anyone's game but Greg Debora, who held the lead for most of the day, was the next to go. The heads-up battle between Olson and Tulchinskiy lasted for more than two hours with many lead changes, but eventually the former delivered the final blow. Before the flop a raising war reaches its epic conclusion as Mikail Tulchinskiy was all in for his tournament life worth 230,000 chips. The board ran out and Tulchinskiy was knocked out in second place. Mikail Tulchinskiy raised and David Olson called. The flop came down and Olsen check-raised, Tulchinskiy called. The turn was the and Olson bet, Tulchinskiy folded. The flop showed [Ac7h3c[ and Mikail Tulchinskiy bet, David Olson called. The turn was the and Tulchinskiy bet again, Olson called. The river was the and Tulchinskiy bet, Olson raised and Tulchinskiy called. Olson showed and he took down another pot. Mikail Tulchinskiy raised from the button and David Olson called. The flop brought out and Olson check-called a bet. The turn brought out the and both players checked. On the river the and Olson bet, Tulchinskiy folded and Olson regained the lead. Mikail Tulchinskiy raised from the button and David Olson three-bet from the big blind. The flop brought out and Olson bet, Tulchinskiy called. The turn was the and both players checked. On the river the hit and both players checked again. Olson showed and he raked in the pot. The final two players in this Championship Event have been playing small pots, and it seems like we're waiting on a clash of big hands. Play will continue in 20 minutes. The flop showed and Olson check-called a bet. The turn was the and both players checked. The river was the and Olson bet and Tulchinskiy called again. Olson showed and muck when Tulchinskiy showed . The board read and Mikail Tulchinskiy check-called a bet. The turn was the and both players checked. On the river the hit and Tulchinskiy check-called again. Tulchinskiy showed and won the pot as Olson had . David Olson raised from the button and Mikail Tulchinskiy called. The flop came down and Tulchinskiy check-called. The turn was the and Olson bet, Tulchinskiy called. The river was the and both players checked. Tulchinskiy showed and took down the pot. The flop read when Mikail Tulchinksiy check-called a bet. The turn was the and Tulchinskiy check-called again. The river was the and both players checked. Tulchinskiy showed and won the pot. 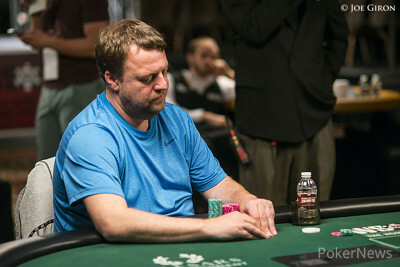 A few hands later Olson checked on a flop and Tulchinskiy bet. Olson raise and his opponent called. The turn was the and Olson bet, Tulchinskiy called. On the river the hit and Olson bet, Tulchinskiy called and showed . Olson showed and his hand ended up in the muck. 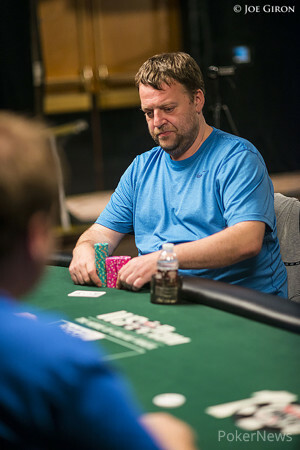 David Olson raised from the button and Mikail Tulchinskiy called from the big blind. The flop came down and Tulchinksiy check-called. The turn was the and both players checked. The river was the and Tulchinksiy bet, Olson folded. Three hands were just won by Mikail Tulchinskiy and he's now back up and out of immediate danger of being knocked out. First he called Olson's button raise and both players checked the flop. The turn was the and Tulchinskiy bet and Olson folded. Two hands later Olson raised from the button and Tulchinskiy called. The flop brought and Tulchinskiy bet, Olson called. The turn was the and both players checked. On the river the hit and Tulchinskiy bet, was called, and showed to win the pot. On the third hand Tulchinksiy raised and Olson called. 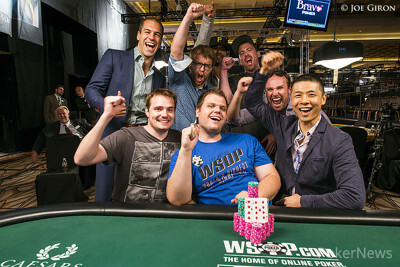 The flop came down and Olson check-raised, Tulchinksiy three-bet and Olson called. The turn was the and Olson check-called. The river was the and both players checked. Olson showed and mucked when Tulchinskiy tabled .